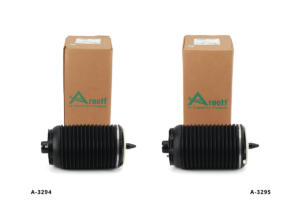 Many Audi vehicles with air suspension are covered by Arnott’s new aftermarket replacement air springs. The A-3294 (rear right) and A-3295 (rear left), fit C7 Chassis in 2012-2018 Audi A6/A6 Quattro, 2013-2018 S6 and S7, and 2014-2018 RS7 models with air suspension. The new air springs feature a ContiTech OE-quality air sleeve, CNC machined aluminum top and piston, heavy-duty crimping rings and protective dust cover.